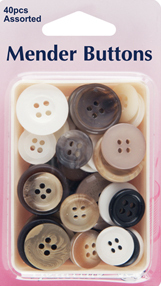 Extensive selection of buttons in popular outerwear colours. Suitable for use on coats, suits, jackets. Supplied in reusable plastic storage box. Assorted size - 40pcs.